The 2005 Xterra will be offered in three trim levels  S, Off-Road and SE. Each model comes with a standard 4.0-liter 265-horsepower V6 and is offered in both 2WD and 4WD. Starting Manufacturers Suggested Retail Price (MSRP) for the Xterra S 2WD M/T is $20,800. The Xterra Off-Road model with 4WD M/T features a MSRP of 25,500, while the SE 2WD A/T features a MSRP of $25,300. 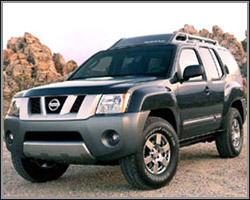 The 2005 Nissan Xterra continues the theme of the original  everything you need, nothing you dont. But now truer than ever, The enhancements for the second generation Xterra, all in keeping with the spirit of the first, include a redesigned interior and exterior, new engine and platform. Xterras new exterior styling evokes that of the original, including a highly functional roof rack (now with covered gear box). Inside, the 2005 Xterra offers more room, especially in 2nd row head room and leg room, and enhanced utility of the multi-flex cargo area  including an Easy Clean Cargo Area and a Utili-Track channel system in the cargo floor.